The Tanji fishing village is one of the most colorful and authentic places to visit in The Gambia. Each day, when the fishing boats arrive, the locals walk into the sea to assist the fishermen to unload their catch and carry it onshore where it's immediately sold on the Tanji Fishing Market. I expected to see many cats at a place with so much fish, but I only spotted two of them. You can see more pictures of the Tanji Fishing Market and read my travel stories of this area here and here. Disclaimer: My trip to The Gambia was sponsored by The Gambia Tourism Board, Coconut Residence, and SN Brussels Airlines. Oh, precious kitties. I hope they get to eat fish and that they're safe. I'm off to look at your other Gambia links. Well, the two that you saw look to be well fed! Living in a fish market would be any cat's dream. Wow a fish market = win/win. Have a serene and easy Sunday. The first one looks so pitiful. And he should be laying in that sun!! I have concluded that he may be ill. Poor baby. The second one almost looks Siamese. Ils n'ont l'air d'être très heureux ces chats. Pas de chats ou presque dans un village de pêcheur ? Ils ne sont peut être pas du tout les bienvenus. Great photography. The photographer caught the right angles of the cats. We also hope that these sweet kitties stay safe, glad they have fish to eat. I can see why kitties would like to live at a fish market! Orange cat is pretty. You would think there would dozens of cats about. The fish market must be a life line to some of those cats - the ginger and white cat looked as though he had a full tummy! They both look like sweeties! That is so cool. 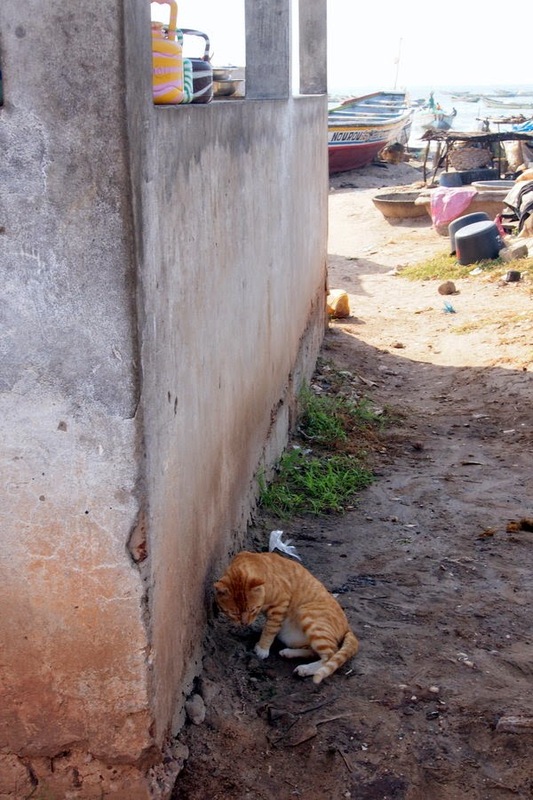 If I were a cat, I'd want to live in a fishing village too! I would hang out in the fish market too!! They look very content!! Well, those two kitties get all the fish! I like that orange tabby. I think I might know him from da hood. I hope they don't get in trouble with the fishermen! Have a nice day! That kitty sleeping in the dirt sure looks comfortable! MOL! I always love looking at these pictures. Wow. Those pictures give a whole new perspective on life and how spoiled we are in the US. I love your cat posts. Thanks for sharing on Motivational Monday.